Welcome to the Scottish Chiropractic Association. The Association was formed in 1979 and has since grown rapidly. There are now more than 85 members practising in Scotland and over 120 associated members located in England, Wales, Northern Ireland and various other countries around the world. Please look round our website by selecting from the menu items to the left. You will find lots of information and find out more about the benefits of Chiropractic. You will also find the answers to questions and will see how Chiropractic can be a key to a healthier life. You can also search our member directory and find your nearest Association member. Our directory gives full member details including contact details and a link to a map so you can find the member easily. 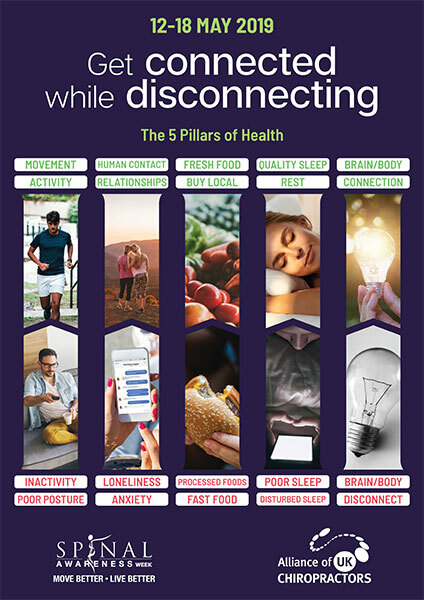 Spinal Awareness Week is 12th to 18th May 2019 and it promotes the importance of taking care of your spine and nervous system.